There are times when it is necessary to search censuses or other records manually. 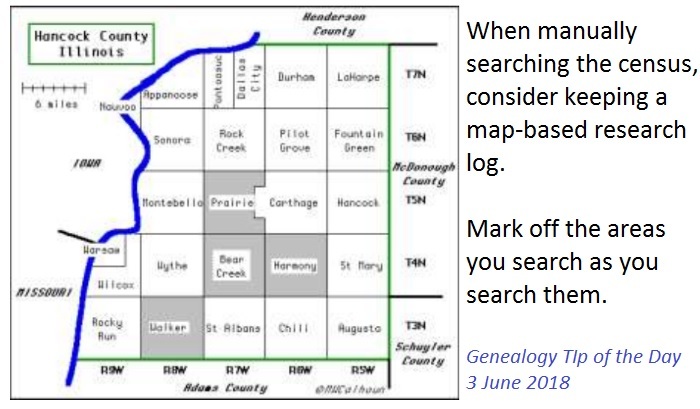 Consider keeping a research log that uses a map to show where you have searched instead of a table or grid. Mark off the areas you search. The map also helps you to search those areas that are closest to the ones you have already searched. This is particularly helpful if the area you are searching in is not one with which you are familiar. It is helpful as well to use a map from around the time period of when the census was taken. Boundaries of counties often change. When you create your map log, what did you use to generate the county malp? Also , do you have tips on finding a map of the wards in a.larger city? Thanks. I live this idea and want to try it out and pass it on to my genealogy society.